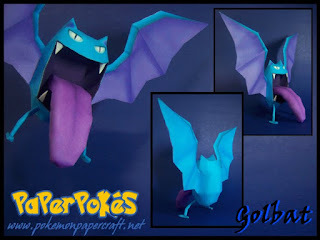 Interesting Facts: Golbat has a large mouth with four fangs. It now has a small pair of eyes. Golbat has a short pair of legs that possess only one toe each, and the tails it possessed as a Zubat seem to have disappeared. Golbat's ears are much smaller compared to Zubat's, being triangular in shape and having ear insides that do not appear chambered. Golbat's wings, unlike Zubat, also only have one 'finger' instead of two. NOTES: Follow the numbers, being a bit careful with the way the wings and ears go together. Close at the bottom, and attach the feet. Put a little weight in the tongue to make it stand. Further instructions included in the pack. Yes, the tongue is optional. Depends, if you plan on making it stand on the feet it ain't optional, if you plan on hanging it from strings or make it float somehow, it's optional. haha, i love the huge tongue on this model, this made my day!